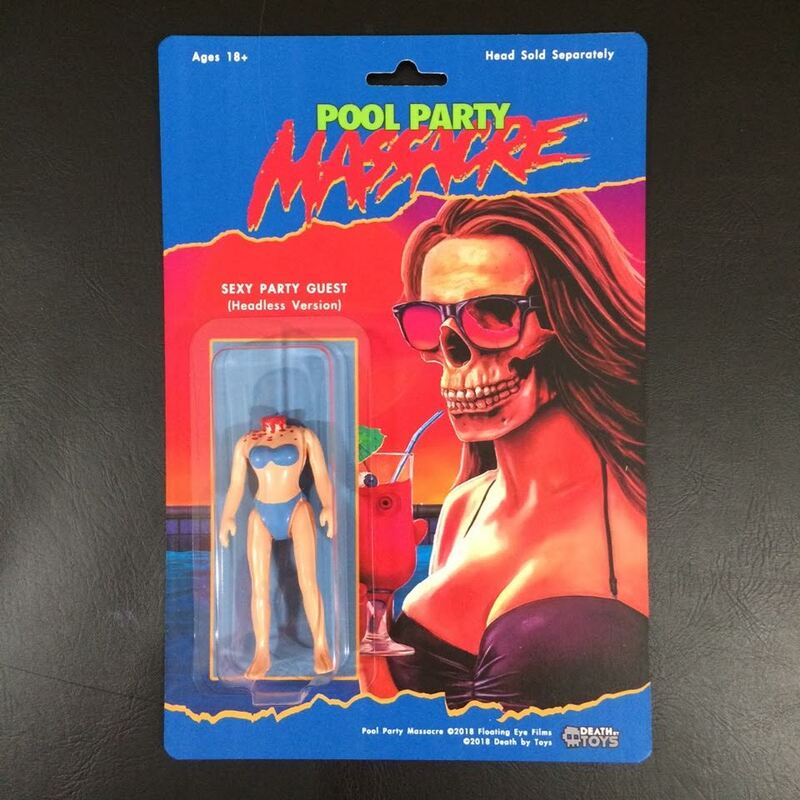 It’s nearing the end of summer, but there’s still plenty of time to have some friends over for a pool party or, if you’re the introverted type, why not round out the warmer months with THE HEADLESS PARTY GUEST FIGURE VARIANTS created by Death By Toys in celebration of Drew Marvick’s POOL PARTY MASSACRE. This run of 20 headless figures is the second edition (the first featured purple bikinis) of headless party guests to be released unto the world – the first run were released in conjunction with the DVD and Blu-ray and sold out in minutes. If you plan on attending Horror Hound Weekend in Indianapolis on August 24 swing by the Pool Party Massacre booth where 10 of these figures will be on hand (along with other movie related merchandise), the remaining 10 figures will be released on the Pool Party Massacre web store the same day. These designer figures are sure to spice up your collection and you won’t lose your “head” over the price tag of $45 USD. 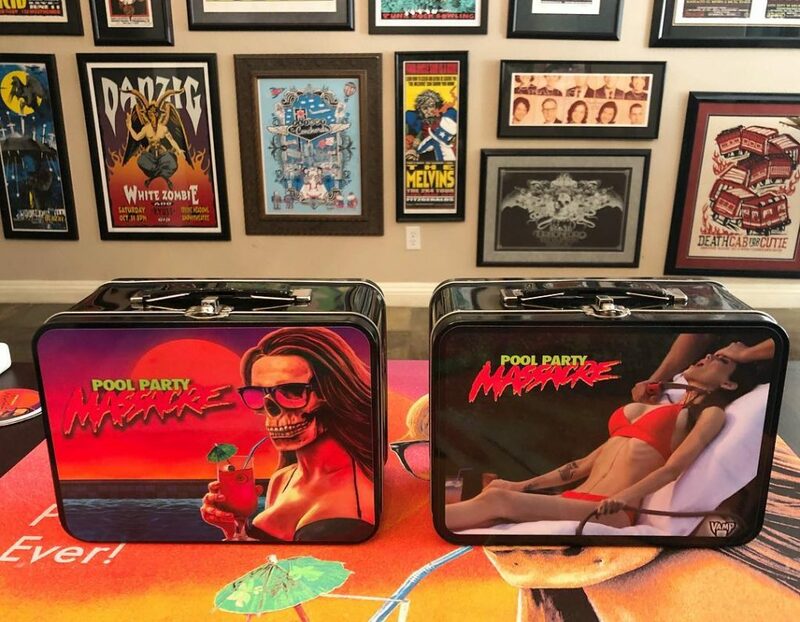 In addition to the figures, the Pool Party Massacre web store have some other really cool movie related merchandise including two versions of THE POOL PARTY MASSACRE LUNCH BOX (one features the poster art for the movie and the other one features an image from the movie of LeeAnna Vamps character Mrs. Stevens getting her throat slit). Check out the mock magazine ad made up to promote the lunch boxes below. Both version of the lunch box have a price tag of $15 USD. These 10 colour hand-pulled silk screen posters feature the art of Marc Schoenbach and have a great retro feel due to the silkscreen printing process. Posters are limited to 150 and come signed and numbered by artist Marc Schoenbach. 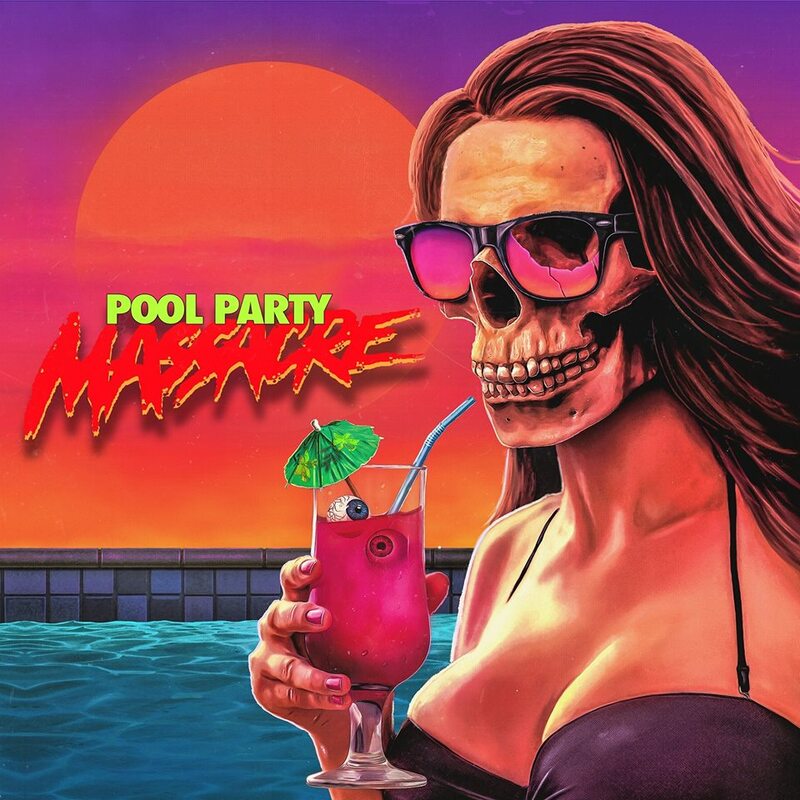 Everyone can use an extra tee and now Pool Party Massacre is offering two different original designs to choose from (Pool Party Massacre poster art and Pool Party Massacre “Splitting Headache”). These t-shirts are available in sizes small to XXXL no additional cost and are sure to turn the heads of anyone who sees them. Other items which can be found in the store include Pool Party Massacre DVDs, Blu-rays, “Let’s Get Hammered” drink Koozies and Truck caps, or if you prefer there are a few different merchandise bundle options also available. 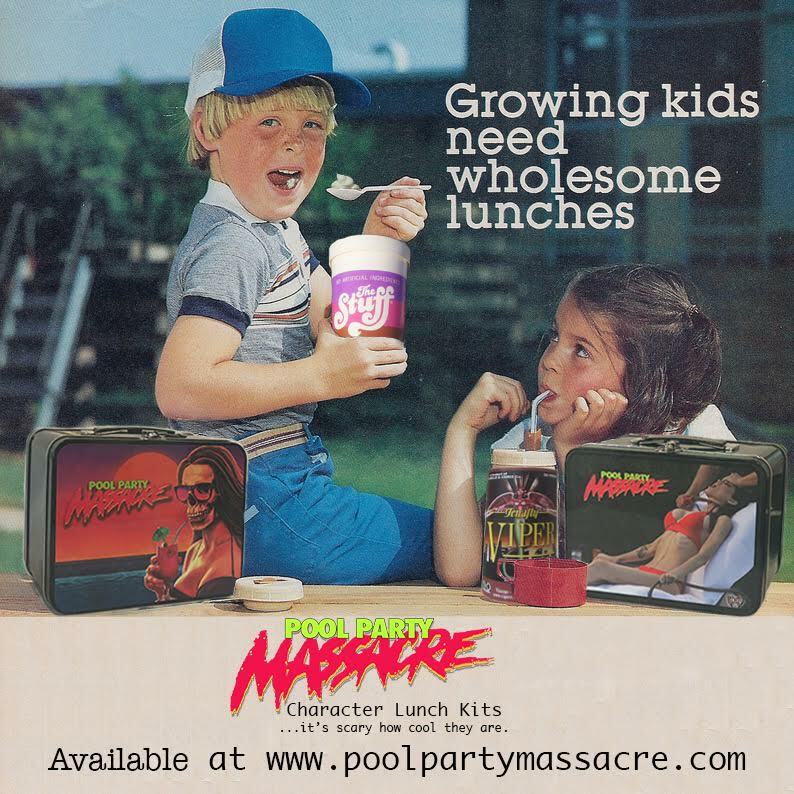 POOL PARTY MASSACRE is an indie slasher film heavily influenced by the slashers of the eighties. The movie is out on physical media (including VHS) and will get a wide digital release on August 17 with thanks to Terror Films. Check out the not safe for work trailer below. Thanks for helping us spread the word about our whacky little no-budget indie slasher!! !